Man, this line has literally been stuck in my head since the first time I listened to this song! Don’t judge me. Queen Bey is my girl but that line definitely over steps confidence and slides right into pride’s home base. In my mind, P.R.I.D.E. stands for People Really into Demonstrating Egos. Yes, I know it’s corny but if someone is prideful, wouldn’t they also be considered as obnoxious and self-centered? Where is the compliment in that? Honestly, I value being perceived as a woman who exudes confidence and conviction. I have always been driven by my love of people and sense of accomplishment. However, there were too many times in my past where my confidence tripled and transitioned into pride. I’ve had a few relationships that were tarnished due to my “Wrong and Strong” attitude. I know you are familiar with this term. It’s that person who only sees things their way and even if they are right, their delivery of the truth makes you oppose them. Yup, that was me. If I had a penny for every time I was told “It’s not what you say, Kiki, but HOW you say it”, I would be rich! Like Oprah rich. You’ll notice that I reference Oprah often. You have to respect her because she is a “tell you like it is but hug you after” type of lady. Kind of like me, ha! Seriously though, I admire her because she is an influential black woman who gets paid billions to say and do whatever she wants. I’m sure she has some restrictions but I don’t witness the filter so she’s pretty much invincible in my eyes. According to writer, Mfonobong Nsehe, on Forbes.com for 2014, “This year, Nigerian oil tycoon Folorunsho Alakija joins American TV mogul Oprah Winfrey and Isabel dos Santos of Angola as the only black female billionaires on the FORBES billionaires list.”Although my name will be mentioned in the future, how amazing is that? And this goal is not about money. Please don’t get me wrong, I will absolutely embrace being a billionaire one day. However, I’m referring to being an elite hard worker who paves the way for those to come after you. She is an African-American who is a woman and media mogul. She is so inspiring that I could not express to you in one simple blog post what her existence means to me. It’s more than Oprah’s success. Her life is inspiring yet intimidating because she confirms for me that in order to reap the rewards you must go through a PROCESS. I’m not sure if you are familiar with Oprah’s biography but she certainly did not become famous overnight. I know we all love going through a process, don’t we? Nope, me neither. However, we have to endure a process to move to the next level. 2013 was one of the hardest years of my entire life. That’s because so many of my layers were removed. First went my pride. Then onto losing many desires. And I can’t forget about my need for people’s confirmation. They all vanished. It was scary and peaceful all at once. I am human so life does throw me curveballs but I now can humbly approach each stage. Even though sometimes I wish I could, I cannot control my circumstances; I can only control my reaction. Every single day is a chance to get better at it. I understand that these stages are all necessary to become who God has designed me to be. Looking back, there are so many experiences that I wish that I could: control + alt + delete! But would I be the Kiki that I am today? A great lesson I’ve learned is that my happiest moments, trials and tribulations are not just for me. They are so that I can sincerely encourage someone along their way. Not that I feel old or anything *cough* but that fact that I am turning 27 this year reminds me that time waits for no one. You ever hear that saying that the only the constant in life is change? Well, that is absolutely true. Like the quote above says, life is a process of becoming and involves going through different stages. If you are the same person at 27 years old that you were at 19 then you are wasting time. It’s definitely not easy but “Let us not become weary in doing good, for at the proper time we will reap a harvest if we do not give up” (Galatians 6:9). There are so many questions that run through your mind when you start growing as a person. Honestly, I had a few of my own. What will people think if I change? Will I have any friends if I no longer like to party? Looking back, none of these questions even mattered. No one’s opinion will grant you eternal life but God. Overall, change is hard but good for the soul. 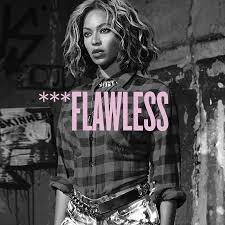 It is so easy to point out someone else’s flaws even if they wake up flawless *cue Beyoncé*. The hard part is looking in the mirror and taking ownership of your own areas of improvement. That’s exactly what I had to do. I still have a little feisty side but it’s less prideful and more courteous. I make a decision every day to keep making positive changes. Before I accepted the reality of growing in my faith, my maturity was stemmed by a book called “The Secret” by Rhonda Byrne. Once I read it, The Secret motivated me to rebuild my perspective on life. My blossoming is focused on my character thus far and that pride of mine had to get the boot! We should all ask ourselves: What’s holding you back from dancing into your next stage of this thing called life? Pride was first for me, what about you? I know that using this subject for the first entry is pretty funny but as you will see, I’m a bit random. Don’t judge me, ha! I cannot tell you how long I’ve said that I wanted to create a blog. I would spend hours on end reading blogs from various writers. My bachelor’s degree is in Mass Communications: Public Relations and nearly every job I applied for requested my blog’s link. I never quite got around to building one but I have always loved reading them. Whether I was reading about God, weightloss, celebrity gossip, or fashion, you name it: I had a blog to turn to. You guessed it; nope, not my own. I started thinking back to all of the things I wanted to do but never got around to doing them. In middle school, I remember wanting to run for class president. I never submitted my application. In college, just like some of you, I had so many sleepless nights writing papers until 4 o’clock in the morning the day they were due. Until this very day, I even create long to-do lists and rarely complete them. Well ladies and gentlemen, it’s because I was busy being “fake busy”. Yes, I said fake busy. By fake busy, I’m referring to doing numerous things and not accomplishing anything at all. “Fake Busy.” I am a champ at it. I guess I was tricking myself to believe I was actually achieving something. Instead, I could have been planning a dinner for friends (I’m Martha Stewart in my mind) or reading that book that I’ve put off. You know what I mean, doing something productive. I always hear people refer to my generation as the “Microwave Generation.” I don’t know about you but not much has come to me quick nor easy; hints why I struggled with procrastination so long. You remember that day you looked around at your peers and wondered where did things go wrong for you? Yup, I’ve done that too. I just knew I would have my master’s degree by now or I would be Oprah! You could not tell me that I wasn’t a hustler! I had to be real with myself because hustlers do not wish for things, they do them. “I’m the type to say a prayer, then go get what I just prayed for” (Meek Mills song, “Amen”). I was always a hard worker and accomplished many milestones in my life. My problem was that I stayed in the safe lane. This is not always a bad thing because the woman I am today is a direct result of my decisions. There are so many things I should have done but I use every missed opportunity as a lesson learned. 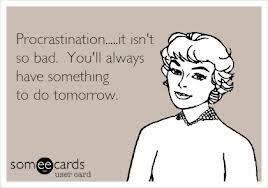 Procrastination is not 100% a negative trait. It means that you acknowledge there are things to be done. The next step is simple: just do them. Not later but right now. Like Albert Einstein said, “Insanity is doing the same thing over and over again and expecting different results.” Do something different by fulfilling those desires. It does not matter how small the task is, just do it now and your life will be rewarding. For me, I had to figure out what was causing me to postpone things. Fear of failure? No resources? No time? Honestly, I was just being lazy a lot of times. For example, it snowed this week in Virginia and I had one full day off this week. I was so excited because I was traveling for work last week and had so much to do. However, instead of doing any of that, I committed my time to reactivating my Twitter account. Do Not Judge Me! Ha! I know that I’m not alone but we all know scrolling through Instagram nor Twitter qualify as life changing activities. Well, it could be depending on who you follow. Ok you’re right, I’m stretching. Hopefully, we will all have an experience in our lives that eliminates procrastination and releases productivity. Building my relationship with God really helped me see life in a different perspective. We are here to do the work of His will. Realizing that it wasn’t about what Kiki wanted to do today or tomorrow really did change my life. How can He use us for His will when we’re busy being fake busy? Now I see every day as a new opportunity to become better and help someone do the same. Also, we know tomorrow isn’t promised. I’m always super grateful when I wake up in the morning because I know that day has new purpose. He has placed so many new desires in my heart ranging from my position as an Admissions Representative to the different women’s groups that I participate in. However, I cannot just believe I will do amazing things; I have to start doing them! James 2:26 says, “For as the body without the spirit is dead, so faith without works is dead also.” You can have an amazing idea but until you do the work, it is nonexistent. We all know that actions are so much louder than words. If we simply stop filling our time with fruitless things, we can accomplish so much more. Take the time to sit down and figure out what your real goals are. What is that idea you brainstormed about but never got around to starting? Honestly, I am still working on procrastination. My current goal is to become a morning person so that I can wake up, work out and BEAST in the gym! I’m only half-joking. Seriously, it is a decision everyday to change for the better. However, I’ve learned that if something is truly important to you, you will make time for it. What is more important than becoming the best you?